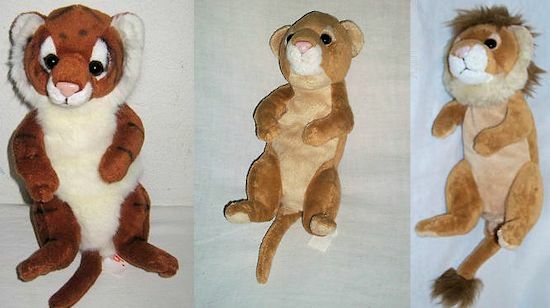 I’m looking for part of a set of baby jungle kittens made by E&J. Each kitten is about 12 inches long and lying on its back (in the position you would cradle a baby). So far I own the black panther. I know they made a Bengal Tiger and 2 different lions (one with a mane, one without). I’m not sure if they made any others, but if they did I want them! I’m unsure of the year they were released. These kittens are so important to me because of my little black panther Luca. Our friendship started in an odd way. I am a curb crawler (means I go out on garbage day and look for cool stuff on the curb). Well, I went past a house that had just recently redecorated, and there were two garbage bags FILLED with stuffed animals. Most were in almost new condition, and (after I verified that there weren’t bedbugs or something like that) I re-homed most of them. In the bottom of the second bag was the sweetest pair of brown eyes staring up at me. I pulled out this little baby panther (who was missing his nose) and just fell in love with him. It has taken me a while to find out his brand (his tush tag was cut off), and now I really want to find his “siblings”. This little guy means so much to me, and I would love to have all of the kittens. I know I will love them as much as I love him. All 3 are currently on Ebay! The maned lion is item# 150969109051 . The un-maned lion is item# 230886553454 . The tiger is item# 230872793350 . There’s an inexpensive leopard baby on eBay 171120170365, too! Dirty Butter i hadnt found that leopard before!! thank you so much! We just came across one of these..
She is cute as can be, contact me if you are still looking for one! Lisa W, which one is it do you know? If it’s either of the lions or the white tiger im very interested! It is the little lion, like the first one pictured.. Ours does have the tag cut off, but would be more than happy to send a picture! There are several different kinds on ebay right now for around $40.00- $60.00. It seems this is about the regular price as they are collectibles.